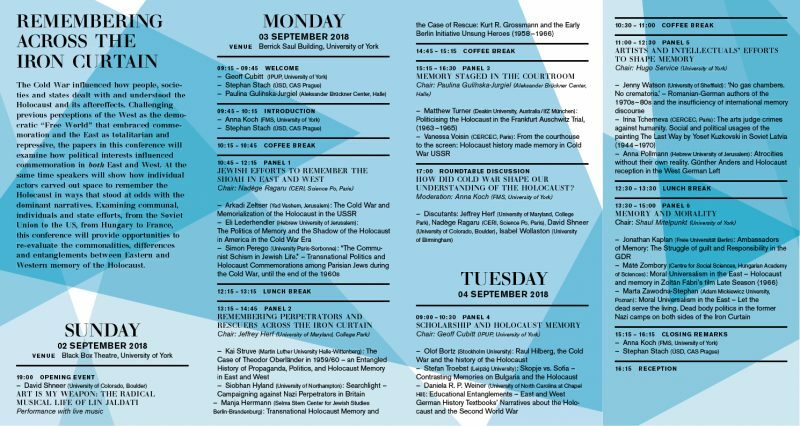 A Joint Conference of the Institute for the Public Understanding of the Past, University of York and the Institute of Contemporary History, Czech Academy of Sciences, September 2-4, 2018. About Programme Participants Location / Accom. How did the Cold War influence interpretations of the Holocaust? What role did ideological frameworks and concepts such as totalitarianism, antifascism or genocide play? How did non-state researchers and their institutes negotiate and situate themselves within the Cold War frame? Did transnational networks develop beyond Cold War boundaries, and what role did Jewish actors and institutions play in such cooperations? How were individual memories influenced by larger narratives? How did they differ from, respond to and resist or challenge public representations of the Holocaust?